Most of the public doesn’t think about what a locksmith does until they encounter a problem such as being locked out or dealing with a lost key or broken lock. Then the search is on to find the professional that can help you with your predicament. It’s often overwhelming and anxiety-inducing when you encounter a problem with your security, whether it be that you can’t get into your home or car or you can’t properly secure your home or business. The locksmiths of Affordable Locksmith of Texas don’t want you to panic and so want to discuss the unknown services that locksmiths can provide, whether you are facing an emergency or simply need an extra key. Do you need an extra key for your home, closet, or padlock? No problem! Most locksmiths offer key-cutting services so you don’t ever have to be without an extra key. It’s easy to reserve yourself to being with one key. However, why take the chance when you could easily have a backup or a convenient copy? Most homes have locks on their doors and windows—UPVC doors and window locks to be exact. Many locksmiths can help you install and repair these kinds of locks. However, sometimes you need an MLA locksmith who specializes in this type of service. They will have access to supplies and will be able to properly fit and service your window or door. Do you have a safe and you’ve lost the keys (both the main keys and backup keys)? Before you resort to blowtorches and a Thor-sized hammer to smash open your safe—we don’t recommend these methods ever—call your local locksmith. Local locksmiths can open, repair, and install vaults and security safes. Have you lost a car key or worse yet, one of those multi-hundred dollar key fobs? Are you dreading going to the dealership and shelling out your hard-earned cash? You actually don’t have to! Most locksmiths offer car locksmith services that include transponder replacement, cutting new keys, and of course, getting you back into your car when you’ve lost or accidently left your key in your locked car. We can’t forget the best piece of information yet: we most likely will charge you less for a new key or transponder key than the dealership! Electronic locking systems are being embraced by both residential and commercial clients. Many commercial businesses have had electronic locking systems accessed by key cards, keypads, or fobs for years. However, homeowners are starting to embrace electronic locks, too, for the same reasons: easy to use, duplicate keys are never necessary, and they are easy to re-program for security’s sake. Next time your electronic locking system needs maintenance, you are looking to upgrade, or switch to an electronic system, contact your local locksmith. We all have been there: when you are staring at your keys lying on the floor of your locked car or you have dumped the contents of your massive purse on the ground and simply can’t find your house key. Regardless of the situation, locksmiths often offer 24-hour emergency locksmith services that can help you get back into your car, home, or business. 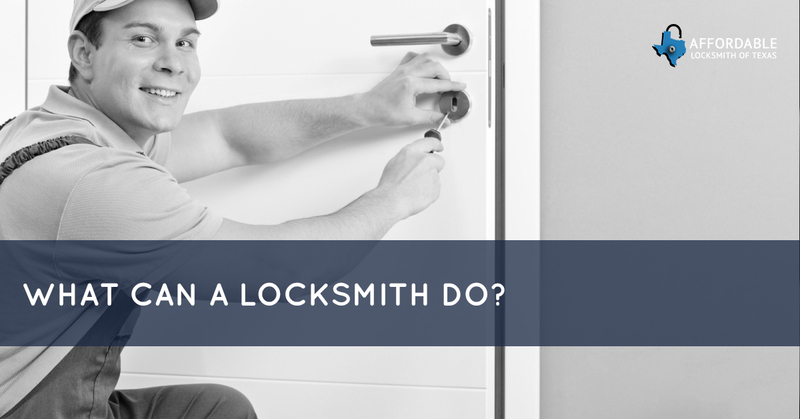 Next time you are locked out, don’t panic—call our local 24-hour locksmith immediately! Need a Locksmith in The Woodlands Area? Are you in need of locksmith services in The Woodlands? Contact Affordable Locksmith of Texas! We offer a variety of locksmith services that can keep those things that are the most important to you safe and secure. Not sure what kind of services you need? Feel free to contact us and ask us! We really do care about our clients and are here to help you. Visit our website to learn more about Affordable Locksmith of Texas, our services, and inquire for a service!